Think federal farm subsidies only help out struggling family farmers? Think again. Fifty members of the Forbes 400 list of the richest Americans – banking tycoon David Rockefeller Sr., Microsoft co-founder Paul Allen, stockbroker Charles Schwab and dozens of other billionaires – got at least $6.3 million in farm subsidies between 1995 and 2014, according to an EWG analysis. And these fat cats likely received even more subsidies through the federal crop insurance program. 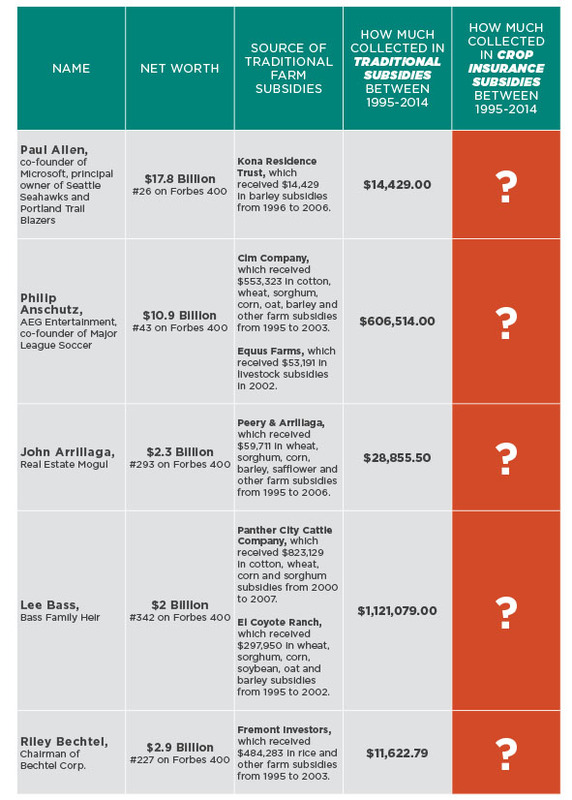 EWG matched EWG’s Farm Subsidy Database with the Forbes 400 list. We found that the billionaires who received farm subsidies between 1995 and 2014 have a collective net worth of $331.4 billion, based on Forbes’ estimates of their wealth. Some of the other notable members of the 1 percent who got farm subsidies include Commerce Secretary Penny Pritzker, the owners of three professional sports teams, and the founder of the Bass Pro sporting goods empire. Of the 50 billionaires, 46 grow corn, soybeans, sorghum, cotton, rice and barley – commodities that are eligible for both traditional farm subsidies and crop insurance subsidies. Only two of the billionaires exclusively raise livestock, which aren’t eligible for subsidies but qualify for disaster assistance. Traditional commodity subsidies are subject to a modest means test that was tightened under the 2014 Farm Bill. Unlike traditional commodity subsidies, however, crop insurance subsidies can benefit any farmer – regardless of income – and the U.S. Department of Agriculture doesn’t have to make the names of crop insurance beneficiaries public. So, taxpayers – and Congress -- have no way of knowing whether farms owned or operated by billionaires get crop insurance premium support. On average, taxpayers cover 62 percent of the cost of crop insurance premiums. The net cost of crop insurance is estimated at $8.8 billion a year over the past three years. A recent EWG investigation found that more than 10,000 individual farming operations received annual insurance premium support ranging from $100,000 to $1 million, and 26 operations each received more than $1 million. Like other farm subsidies, the lion’s share of crop insurance subsidies flow to the most successful farm businesses. According to data EWG compiled from USDA, the top 1 percent of crop insurance subsidy recipients received on average nearly $227,000 a year in crop insurance premium support in 2011 – while the bottom 80 percent of recipients received only about $5,000 a year.